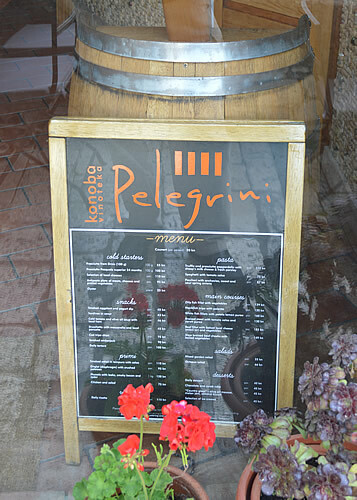 Pelegrini is a lovely little restaurant in Šibenik with a BIG reputation! 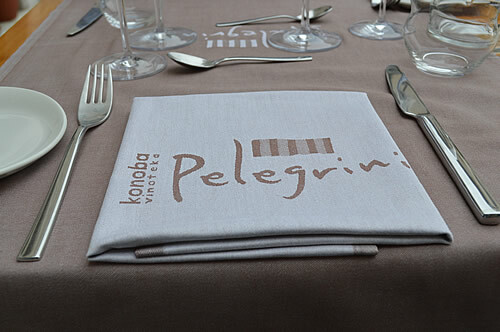 Listed in the exclusive list of the Jeunes Restaurateurs D’Europe, it’s just leapt from being the Best Restaurant in Dalmatia, to being the Best Restaurant in Croatia! 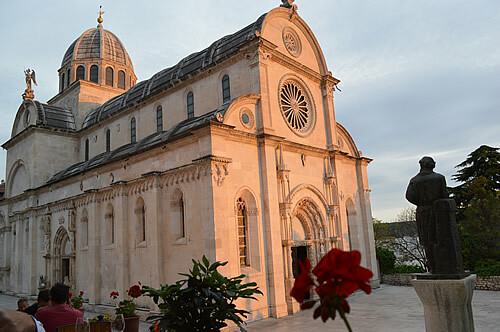 This accolade is voted by Croatian chefs, so it’s a significant achievement and when we visited Šibenik last month, we just had to eat there! 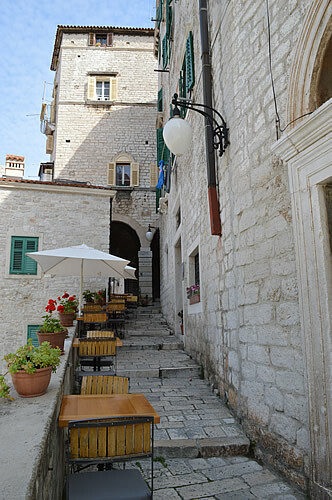 For a start, the location is just gorgeous, a line of small tables up a narrow stepped street overlooking the cathedral. It’s surprisingly intimate, given that people can pass up and down the steps right next to your table. It also has a very nice inside dining room. As we arrive in the early evening, we have our choice of tables, and select one near the doorway to the kitchen. We’ve booked the day before, requesting the gourmet tasting menu, but specifically a vegetarian+seafood version. It’s always as well to give the chef a day’s warning of Her preferences, we find. Owner/chef Rudolf Štefan and his staff certainly lived up to their reputation and did us proud! Rudi is one of Croatia’s young master chefs, and a quick look at the menu showed that he’s very creative in his combinations of flavours. We wondered what would appear on our plates! To start us off, a glass of Bibich Brut, made just a few miles upriver from here – nothing like a sparkling wine to make an evening feel like a celebration! The bread basket, well box really, had three types of bread – plain, rosemary and kobasica. Wait, kobasica is a sausage – well, that’s not very vegetarian! Not for Her, but I was very happy with it, though! Along with the breads was an olive/anchovy tapenade and a selection of olive oils (krvavica, oblica, and a special blend). A jar of salt flowers from Nin completed the table setting. How lovely! 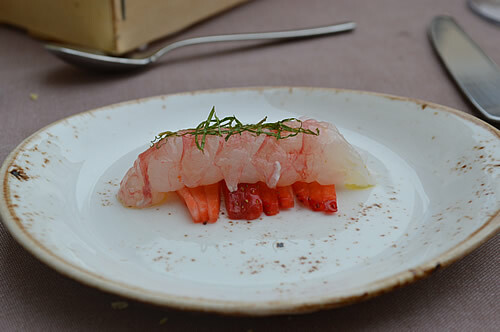 Following that, Adriatic Scampi peeled, drizzled in olive oil, set on thinly sliced strawberry and topped with a shredded mint leaf. Unusual but superb combination of textures and flavours! 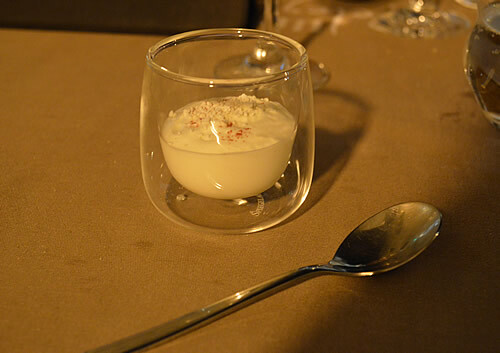 Next up was a very light mousse of smoked aubergine, yoghurt and olive oil, topped with fennel. Again, a very tasty combination of flavours. We think we need to add fennel to our herb garden!. At this point it was time for a change in wine, and we moved on to the Rak Maraština 2013. Rak is a local winery, actually in Dubrava, nearby the falconry centre – if only we’d known! Maraština is varietal native to the Šibenik area, producing a golden-yellow wine with fairly complex characteristics, similar to a pošip. To go with the Maraština (or is it the other way around?) 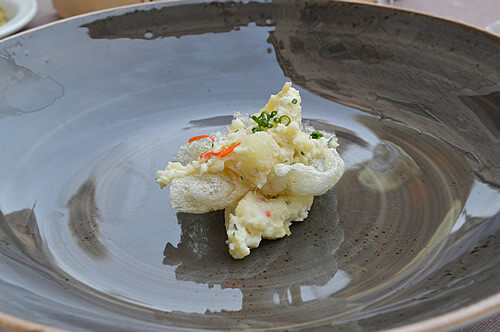 were Codfish skin chips, served with a local cheese and potato salad with parsley, chives and thin slivers of spicy red pepper. Described as a “cross between a fish pie and prawn crackers”. Yum – very light and extremely tasty! Our next wine came from a little further up the coast: Boškinac Gegić – very light yellow with a hint of green apple, lemon and sage. This is another very local grape varietal, this time native to the island of Pag, where we’ll be visiting in a couple of days. 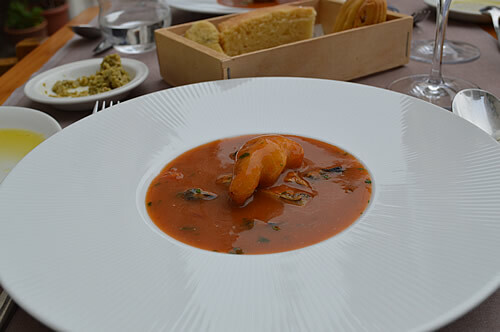 To go with that, a rather lovely soup: Dalmatian tomato fish soup in the manner of a bouillabaisse. Grilled strips of zubatac (dentex) and mussels, topped with an oyster in batter and soup poured over. It’s full of flavour and contrasts well with the acidity of the wine. 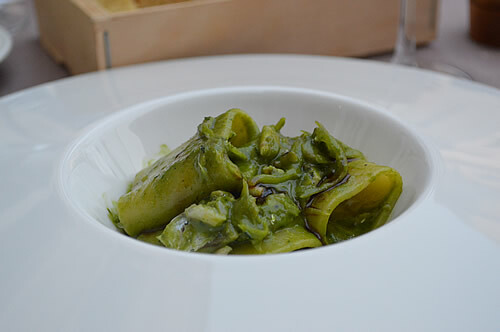 Now for the pasta course: Pakeri (paccheri) pasta, with sweet and sour onions, anchovy, a little bit of pesto, and a touch of chilli and balsamic. It’s a very tasty combination! Served with Grabovac Kujunđuša Sur Lie 2011. This is a lighter wine that comes from Imotski in the Dalmatian hinterland behind the massive coastal range. And it turns out that Kujun is Turkish for gold! By now the sun is setting, casting a beautiful golden glow across the facade of the cathedral, illuminating the main portal. This is the absolute best view of it, and we have grandstand seats! In the building next door to us, a female choir has started to sing, rehearsing for the service later tonight. The ambiance is just sublime. 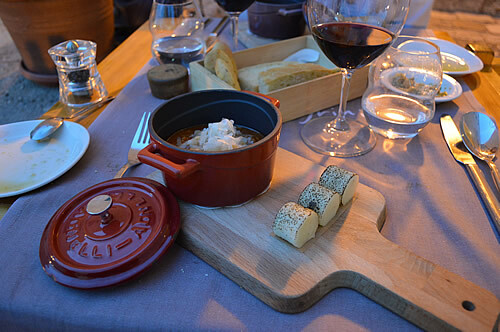 Our next course is a hotpot of Monkfish tripe na brujet with parmesan cheese and rolls of Polenta served with a glass of Bibich R6 – we’ve moved to a red wine. It’s around this time that I realise I’m in trouble. Having polished off the earlier plates, my appetite is now all but completely satisfied and I’ve slowed right down! And of course, the gathering darkness now leaves us in the glow from the streetlights, so the photography is getting trickier! 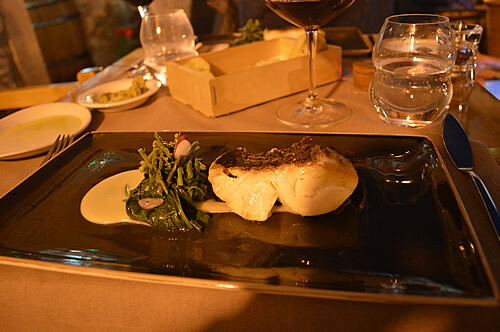 Nevertheless, on to the next course: Zubatac (dentex) filet on a puree of potatoes and lemon, with asparagus, spinach and radish. It’s delicious, and thankfully very light! 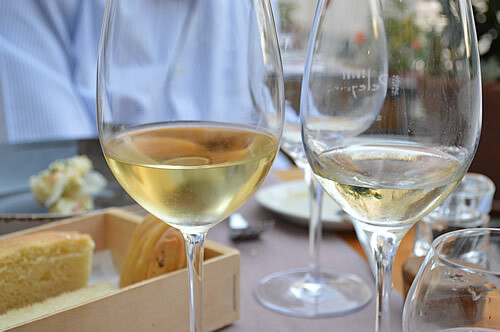 To go with this we’re offered a choice of wines – Grabovac Crljenak (Croatian Zinfandel, grown in its original home of Kaštela) or Bibich La Sin (made from Lasina grapes from the nearby Bibich vineyards). To our taste, the lighter La Sin is a better match for the entire dish, as the more intense Grabovac slightly overpowers the delicacy of the vegetables. 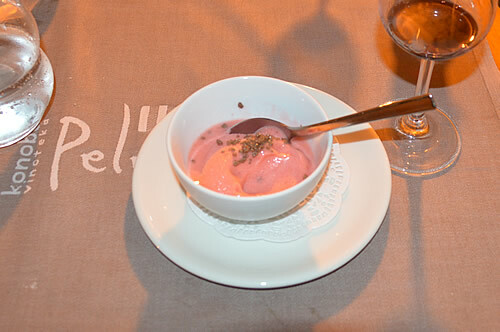 And now for a dessert: Yoghurt and mascarpone lemon cream with kisses of white chocolate and powdered raspberry. It’s delicate and quite sublime! To go with it, we have a glass of Bibich Ambra, a prošek made from plavina grapes. 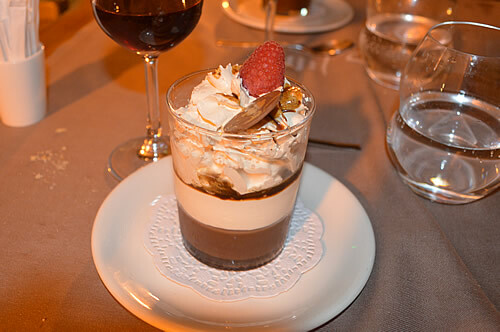 And finally, a chocolate dessert masterpiece – with layers of chocolate cream, mascarpone, rum and coffee, and fresh cream topped off with a raspberry and a choccie medallion. 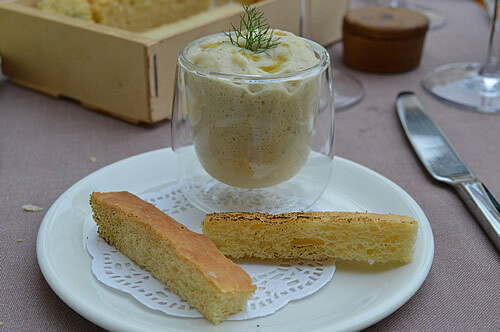 To go with it, we choose to try the house prošek – made on the island of Vis using the traditional method. It has deep dark fruit flavours, reminescent of a Pedro Ximenez! What a spectacular way to finish! It’s been an extraordinary evening, and we’ve enjoyed every minute of it. We don’t usually eat this well – or indeed this much! (Now there’s an understatement!!). But then we were partaking of a UNESCO intangible cultural heritage! Chef Rudi comes out for a chat and it’s obvious why this place is so outstanding. 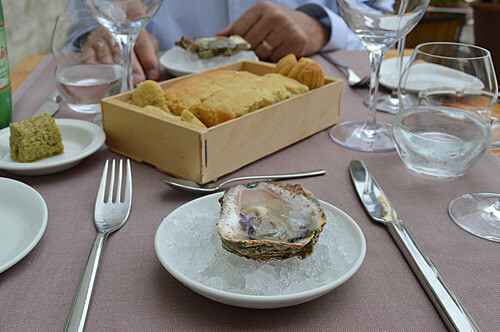 His vision is not simply to produce the best quality food from fresh local ingredients and connected to traditional Dalmatian cousine. 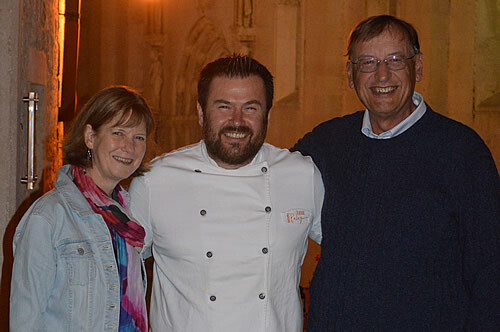 He believes in making sure every detail is perfect and strives for constant improvement, so that the whole experience of dining here is just very special. 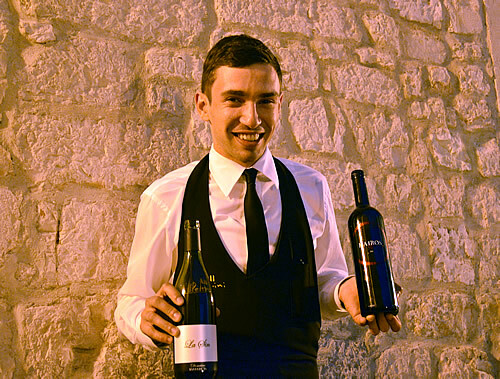 We’d like to thank chef Rudolf Štefan and his team – Sommelier Branimir Vukšić, and our server Jelena Silov for a truly magical evening – you’re wonderful, guys! This dinner is going to be hard to top!